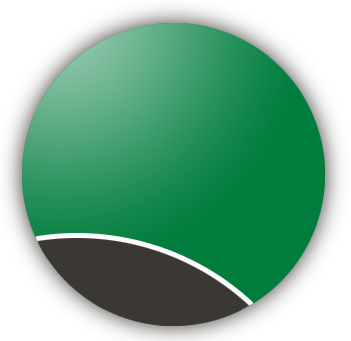 What’s going on with the Spring Texas Real Estate Market? Sales and Pending Sales are up not only for the month but YTD. Listing inventory is down. Home prices are holding steady. Months of Inventory is finally decreasing. 30-year interest rates on home loans are still at historical lows. Good time to be a home buyer? YES. Good time to be a Spring Texas home seller? Improving. Months of Inventory for the same month last year the months of inventory has decreased by 14%. Sales for the month were up and active listings were down. We are starting to experience a return to a balanced market with months of inventory at 6.2 months. 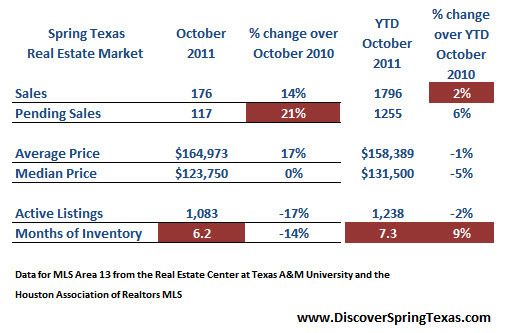 Sale Prices – Year over year and YTD sale prices for Spring Texas homes are stable. Quantity of Sales – October 2011 sales were 14% higher than October 2010. The significant increase is attributable to sales activity in 2010 being impacted by home buyers tax credits which pushed demand into the first six months of 2010. YTD sales volume is up 2% over last year. Not much of an increase on a percentage basis but considering there were tax credits last year and none this year a 2% increase is significant. Days on Market (DOM) – No change from last year at 86 days but the YTD number is 89 which is 13 days higher than 2010 YTD. Bottom line for Sellers: YTD sales prices are holding steady fueled by an increase in sales and fewer Spring Texas homes for sale. If you were going to take your home off the market during the holiday season, you need to reconsider. An increase in sales and fewer homes for sale will result in a higher sales price for your home. Bottom line for Buyers: 30-year fixed interest rates are still near historical lows of 4% to 4.25% making it a great time to buy. Months of inventory is decreasing and the real estate market is turning back to a balanced market. The negotiating advantage you have enjoyed for the last couple of years is slipping away. The completion of the Exxon Mobil campus in 2014 will further increase demand and raise home prices. If your employment situation is secure (whatever that means anymore), then now is the time to buy to lock in a good interest rate and a good deal. The data represented is from the Real Estate Center at Texas A&M University and the Houston Association of Realtors MLS for single family existing homes in Area 13. Area 13 covers a large geographic area stretching from I45 to Hwy 249 to Beltway 8 to Spring Cypress. Not all subdivisions are faring the same. If you are interested in selling your Spring Texas home, give me a call at 281.804.8626 to schedule an appointment.